Etching on fine wove paper trimmed close to the platemark. 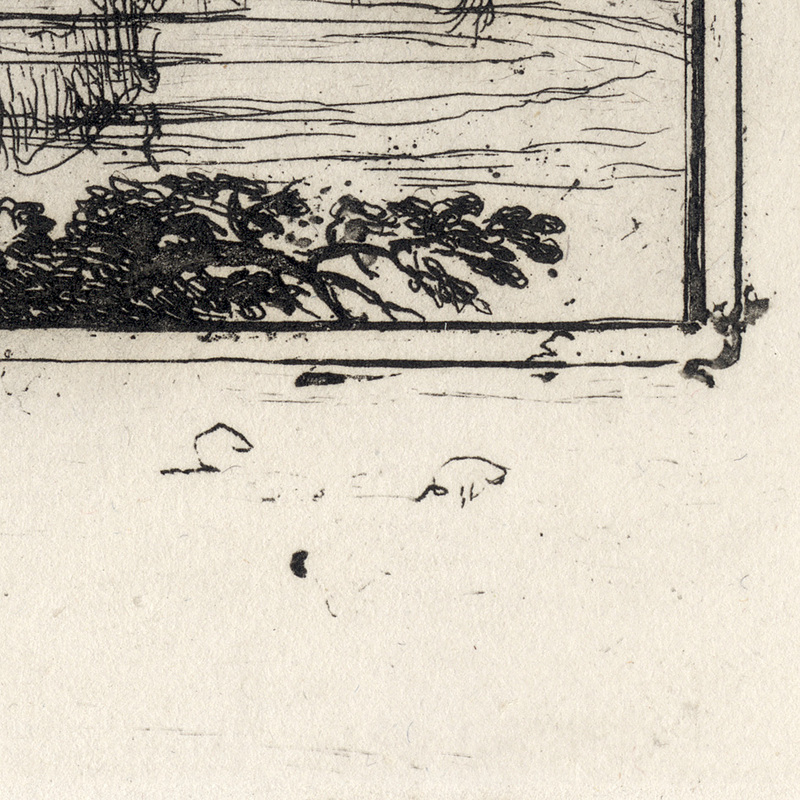 Condition: rare crisp and virtually faultless impression, nevertheless, the lower right corner is chipped and the left corner is lightly creased. Beyond these minor issues there are no tears, significant folds, holes, abrasions, stains or foxing. 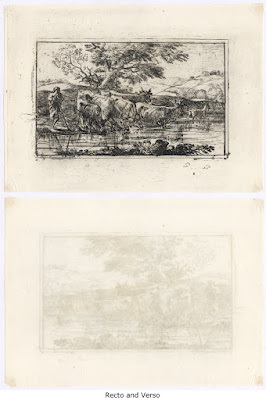 I am selling this exceptionally rare original etching by Lorrain showing the usually removed large margins between the image borderline and the platemark, for a total cost of AU$400 (currently US$306.23/EUR260.57/GBP229.89 at the time of this listing) including postage and handling to anywhere in the world. If you are interested in purchasing this important print, please contact me (oz_jim@printsandprinciples.com) and I will send you a PayPal invoice to make the payment easy. 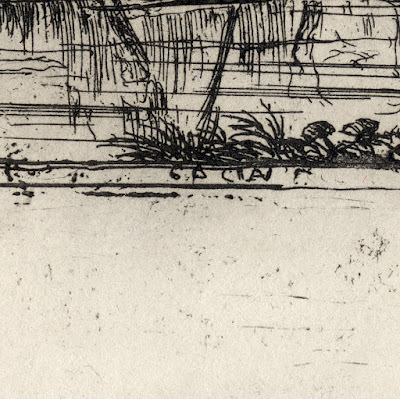 In the previous post I shared my delight and agreement with the explanation offered by H Diane Russell (1982) for the curiously large margins of this print. After two clients expressed interest in purchasing the previously listed impression, I decided to extend the discussion about the possible reasons for the margins by showcasing a rare impression with the margins still intact and other documented ideas about Lorrain’s choice to have margins. 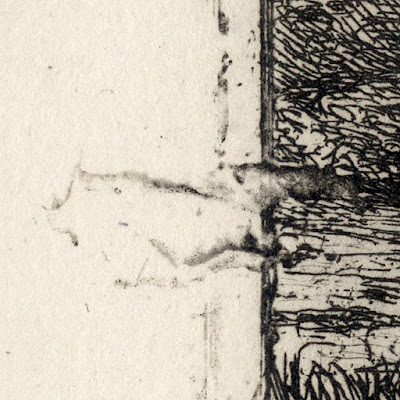 Before I begin, however, I need to point out that Lorrain may not have been entirely comfortable with the scratches, the “faults” (e.g. 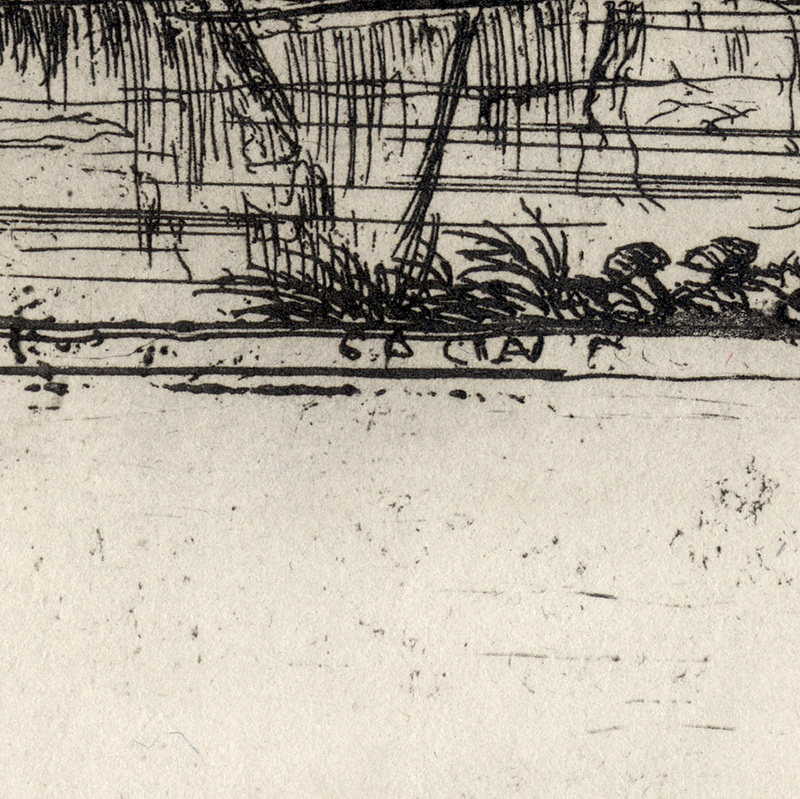 the mysterious imprint of a “break” in the ground on the left edge of the image borderline) and the inscribed marks (like those at the lower right), as there are early impressions showing that these “acts of nature” had been masked during printing so that the resulting impressions have featureless/blank margins. 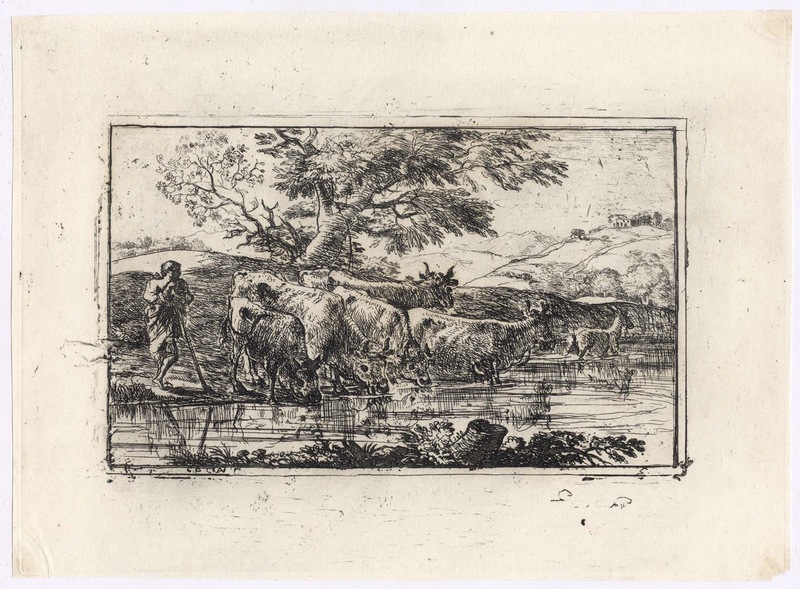 One explanation for the margins is offered by the arts writer, Gustav Lorenzen, who, according to Lino Mannocci (1988) in his catalogue raisonné, “The Etchings of Claude Lorrain” (Yale University Press), proposes: “the rupture to the left of the herdsman might have been caused by the tongs used for lifting the copperplate” (p. 126). This idea seems plausible but Mannocci points out that “such an accident would occur much closer to the edge of the plate and almost always on the longer side of the rectangle” (ibid). 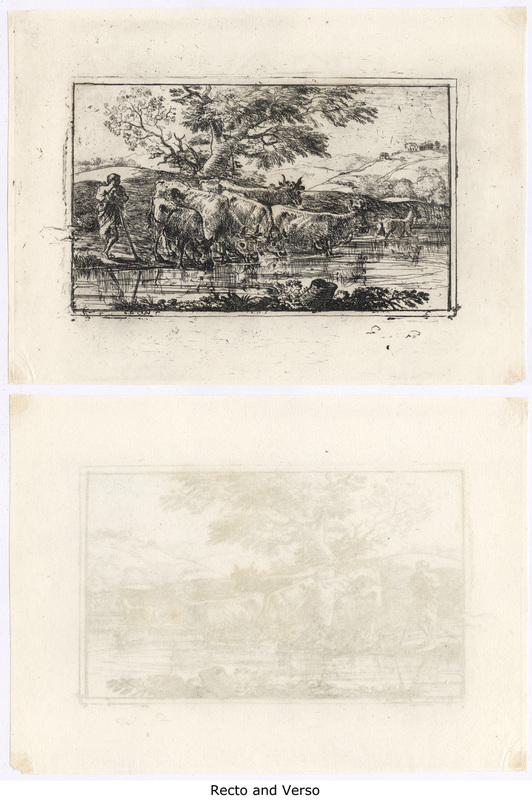 Another idea is that Lorrain was simple choosing the least damaged parts of an already abused plate in which to “frame” his composition. 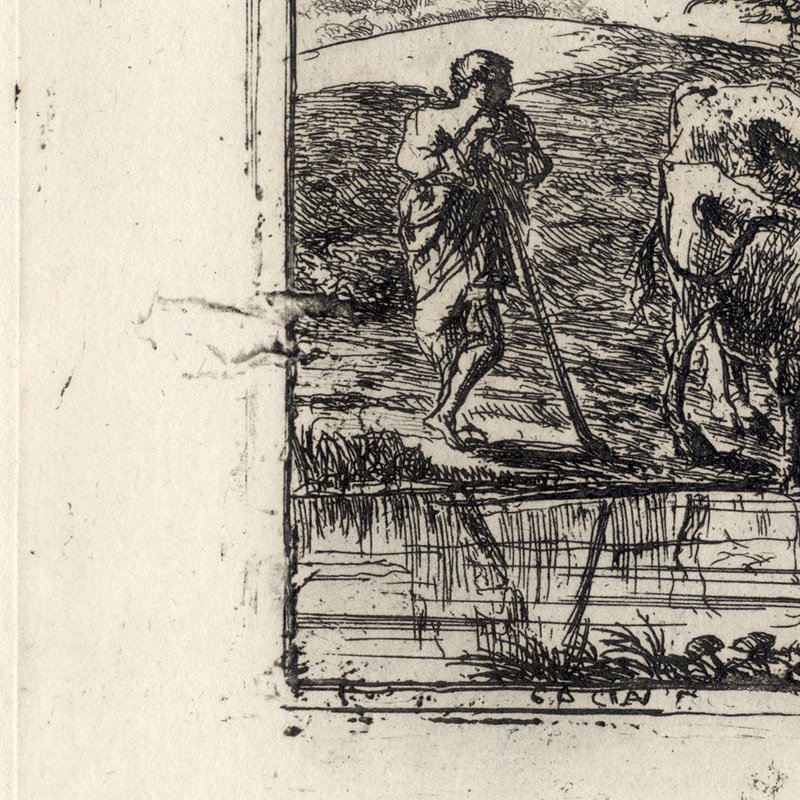 I think that one could put a line through this idea as the layout of the plate is too symmetrical for such selective positioning of the composition … and I doubt that Lorrain would have had trouble in erasing/burnishing away problematic marks if they truly worried him. 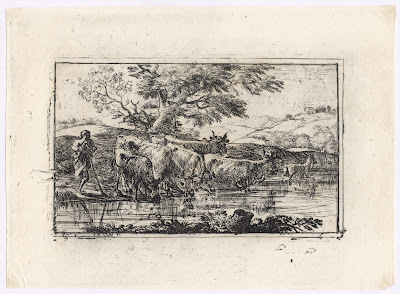 The third idea I will leave for the great Sir Francis Seymour Haden who insightfully commented “It is not a settled plate, but a sketch made at the back of another plate, probably of the “Herd of cattle in a storm”, which is just below it, and which is identical in size” (op. cit. ).